We gotta talk. Or at least we gotta text. It seems many of us can’t go anywhere without keeping in touch with short bursts of text. 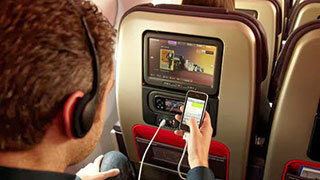 Delta Airlines will make the addiction easier by offering free messaging on WiFi-enabled flights, beginning 1OCT. Pax will be able to communicate at no charge through iMessage, WhatsApp and Facebook Messenger. With the move, Delta becomes the first of the Big Three airlines, which also includes United and American, to offer free messaging. However, it's not the first U.S. carrier to provide the service. JetBlue offers free WiFi on its entire fleet, meaning customers have access to messenger services free of charge. Perhaps more significantly from Delta's standpoint, Alaska Airlines began offering free messaging on its mainline flights in January. Delta and Alaska compete fiercely in Seattle.